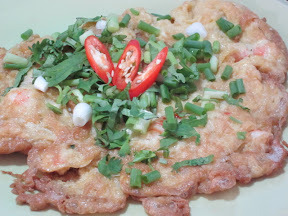 Omelet or Khai-Jiew is the most basic food in Thai household. And it is one of the first few things to learn in cooking Thai food. However we can play a little with our fantasy here, because we can add different things into this omelet e. g. Onion, chili, tomato, mince meat. This dish is good for children. You can have it with spicy Tom yam. With some steamed Rice and Sri-Racha Chili Sauce, you can perfectly have it as your quick lunch. Clean and peel the shrimp, take the meat and cut in small pieces, put in a mix bowl. 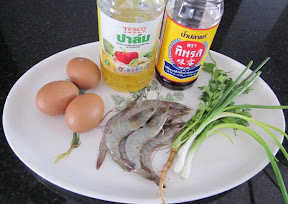 Break the egg into the bowl, along with the shrimp meat and mix well. Add the fish sauce and mix all well together. Heat up the oil in the wok with high heat, when the oil is really hot adds the mixture to fry. When the bottom of the mixture turns golden, flip the other side to fry. When both sides are golden, take out from the pan and garnish with spring onion, coriander and chili. What is the query related to ?